It’s hard to stay depressed in the Apple. I could pick up my mood just by walking the streets. The years on York and 88th were great in many ways, although I was further away from the rest of my family than ever before. That made it difficult emotionally, but made it extra exciting when anyone visited. Marilyn always made it great when they came to see us. I knew some things could happen in my life and career just by being conveniently based in The City. Right off, I got a call to sing and play with fifty goats, a cow, and twenty kids for a Sesame Street music video of “Oh, Susanna!” The shoot, on a Long Island farm, was incredibly cool. It was my first video where I had to lip-synch the singing, which was exciting. We recorded the song at about eight in the morning, shot that afternoon, and we were done! Next. Soon after, I guested on All Night with Joey Reynolds, his famous late-night talk show on WOR-FM. That led to about twenty more times over the ensuing five years, bringing along Matt Cartsonis, David Amram, Martha Redbone, and Jon Mark Fletcher—all great musicians with whom I’ve worked regularly in the new century—and whomever else I could entice to go to lower Manhattan after midnight. I was exploring new music and people for hopeful use in the near future. It was like rehearsing on the radio. During one show I even interviewed the great Les Paul, who was a pioneer both musically and technologically. Immortalized by Gibson’s iconic Les Paul guitar, I asked which invention was his favorite. He said, “They’re like children. I love them all!” I had seen him play and shook his hand at the famed Iridium on Broadway two years earlier, when he was only ninety-two. The intimate and often funny first-hand telling of a Nitty Gritty tale. 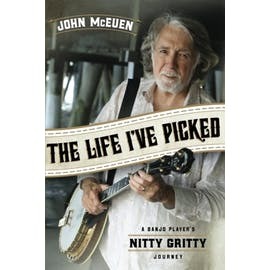 John McEuen give readers his perspective of a life in music as a member of the legendary Nitty Gritty Dirt Band, a solo artist, studio musician, and radio personality, and it’s a must-read any aspiring musician. Find the most current Nitty Gritty Dirt Band tour dates from our partners at Country Music On Tour, your trusted country concert ticket source! Country Music News Blog participates in advertising programs that help fund the operation of this site. For more information please visit our privacy statement. This entry was posted in Featured, Nitty Gritty Dirt Band, Reviews by Shauna "WhiskeyChick" Castorena. Bookmark the permalink.